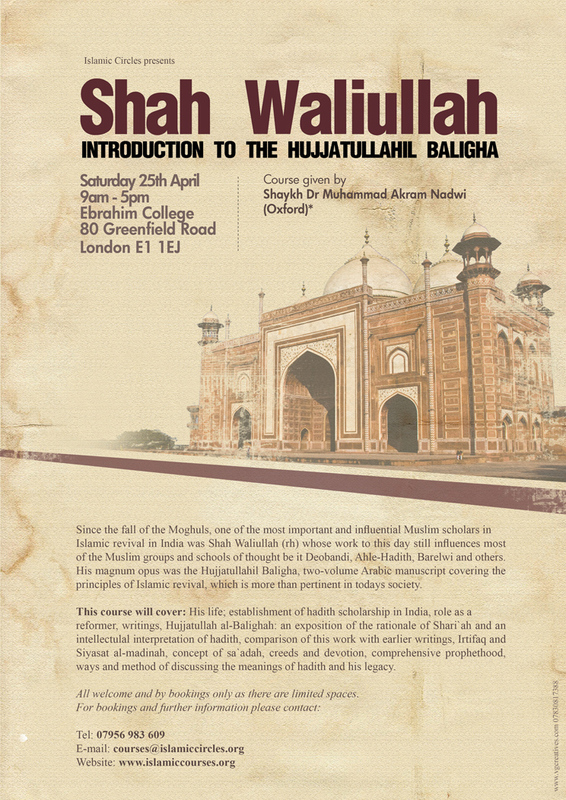 Since the fall of the Moghuls in India, one of the most important and influential Muslim scholars in Islamic revival in India was Shah Waliullah Muhaddith Dehlavi (rh) whose work to this day still influences most of the Muslim groups and schools of thought be it Deobandi, Ahle-Hadith, Barelwi and others. His magnum opus was the Hujjatullahil Baligha, two-volume Arabic manuscript covering the principles of Islamic revival, which is more than pertinent in todays society. 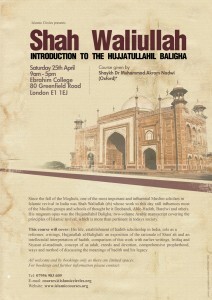 This course will cover: Shah Waliullah’s life; Establishment of hadith scholarship in India, Shah Waliullah’s role as a reformer, Shah Waliullah’s writings, Hujjatullah al-Balighah: an exposition of the rationale of Shari`ah and an intellectulal interpretation of hadith, comparison of this work with earlier writings on the subject, Irtifaq (sociability) and Siyasat al-madinah (issues related to the civil society), concept of sa`adah (the success), creeds and devotion, comprehensive prophethood, ways and method of discussing the meanings of hadith, Shah Waliullah’s legacy. All welcome but those who consider themselves as “activists” or “students of knowledge” are highly encouraged to attend. A basic requisite of the history of Islam in India is recommended but not essential.